The new Air Lift 1000 HD from Air Lift is a heavy-duty version of the air suspension specialist's debut product, the Air Lift 1000 system. After nearly 70 years, the staple product has been upgraded to offer up to 2,500 lbs. of load-leveling capabilities. 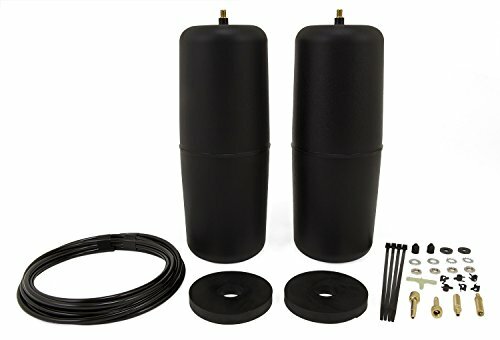 Specifically designed for drivers of RAM 1500 pickups, these custom-molded polyurethane air springs are simply inserted in the rear coil springs, no vehicle modifications required. Working with the vehicle's existing suspension, Air Lift 1000 HD does away with many of the problems frequently faced when towing or hauling heavy loads, including squat, poor headlight aim, unresponsive steering, trailer sway, body roll, and bottoming out. By properly leveling the load, squat is eliminated, braking is improved, and the vehicle is returned to a level and stable state, allowing users to tow and haul with safety and comfort. Installing the kit is a simple process, requiring only common hand tools and no frame drilling. The Air Lift 1000 HD kit comes with a clear, easy-to-follow installation manual for you to use as you add air bags to the existing suspension. As the leader in air suspension products for more than 65 years, Air Lift is committed to delivering quality load support parts that last. The key suspension components have all been torture-tested to ensure the highest quality, longevity, and customer satisfaction. With a limited-lifetime warranty, you can purchase this kit with peace of mind. Take your existing air suspension solution to the next level of safety and comfort with the Air Lift 1000 HD today!